The car trouble at the start of the trip affected me more than I thought at the time, it clearly upset plans and timings I’d made, and maybe subconsciously I think it impacted on my enjoyment. But could I have done anything about this? No. The car and the subsequent illness with my sinuses was just ‘life’ and, as I found out on the Sierra Nevada trip the following year, it’s all part and parcel of doing a road trip. You just have to get on with it as best you can. The days in Wine Country were good and the area is well worth a visit although one does need to be aware of the alcohol consumed in wineries if driving, so whilst I didn’t see a police presence on the roads (at all, I don’t think), I believe one should never take a chance. It was great to visit Levi’s Stadium – match result aside – and the Tour and Museum are very good, although if you’re not a 49ers fan whether this appeals remains open to question. Overall my trip planning worked out well although there were some tweaks I’ve noted for if I ever do the section of Highway 1 again – stay in new places, figure out how to avoid the LA traffic – in part just so that I won’t just repeat what I’ve already seen and done. 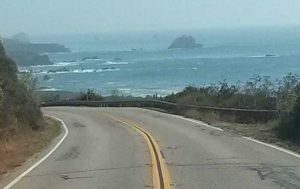 And if you ever do the PCH, I’d definitely say that driving south is the best way to do it, mainly because you’re on the ocean-side and get the best views.